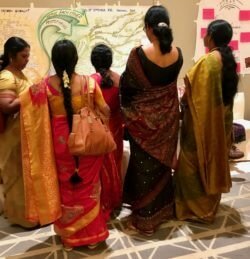 “So… how was it?” is the question most people are asking about our week-long trip to Hyderabad last month. We’ve been struggling to answer this question, especially succinctly. The experience was complex and layered, and so the response feels like it needs to be too. The issue of eliminating sexual violence towards women and children is a global challenge, which has been around for centuries. There are multiple stakeholders involved in this work and their approaches often seem at odds with each other. There were multiple dynamics between groups within the group. For example, between the consulting group and the sponsors, who came and went throughout the week, making it a very porous system in the room. All of this meant that during the week there was a great deal going on all at once, it was shifting all the time, and there is learning to be had at every level of system. Hence, no simple answer to the ‘how was it?’ question. Three weeks out, we’re still processing and we anticipate that the ripples of reflection, learning and integration will continue for some time yet and the answer will continue to unfurl. The derogatory term ‘talking shop’ is often used to refer to meetings, large and small. This phrase can imply that conversation, as a mechanism for change, is ineffective. We believe, however, that talking and conversation are very different creatures. Turn a ‘talking shop’ into a ‘conversation co-op’ and you have a whole different thing. In a conversation co-op, the focus is on creating connection and collaboration as a necessary platform for change. In a conversation co-op people listen deeply to each other, hear different perspectives, and engage in the messy business of developing something new together. The distinction and impact of this shift of focus and approach should not be underestimated. In a complex system, especially one where people feel they have little or no voice, there is something incredibly powerful about creating space for people to find their voices and be heard. This alone is an intervention that supports people to find their individual and collective agency for change. 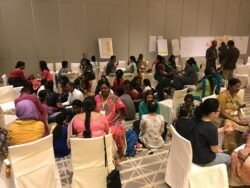 A commitment to creating space for conversation over action flies in the face of conventional wisdom, which suggests that the best way to change things is to get people to focus on committing to action and, moreover, to focus on creating new actions rather than extending actions already initiated. Our experience in complex change is that conversations, designed specifically for connection and collaboration, are what create shifts within and between people. THIS is what then provides the impetus for people to act and for things to happen beyond a single event. Interestingly, our work in Hyderabad fell during the festival of Ganesh, a powerful Hindu God, the Remover of Obstacles. This felt very relevant to our work and this insight in particular, as there are already many initiatives going in India and in the region of Telangana province particularly. It feels like there was rich opportunity to really look at all these initiatives, collectively, to see how obstacles might be removed and initiatives connected, combined amplified. When there’s a system that is complex, comprised of groups within groups, one of the challenges is for that system to see its entirety rather than just its separate component parts. The entirety includes the spaces and relationships between delineated elements. For example, the connections and disconnections between the various stakeholder groups described above. These ‘betweens’ are where the dynamics of diversity and difference play out, they are often invisible and are where, we believe, there is the richest territory for change. Visual maps of the of the system to show: points of focus, flows of information, draw comparisons, create combinations, highlight connections, offer opportunities to make meaning and indicate areas of unity – something we’ll elaborate on in another post. Snapshots of the system through different lenses, over time, to show the shifting dynamics as they play out. Constellations to work with the connections, disconnections, relationships, entanglements and issues within the whole system. The mindset and skillset to work with the messiness of a whole system is key to getting the most from large-group, tri-sector work on complex challenges. It requires a design that is not focused on task alone and allows space for the whole system to connect and reveal itself to itself. For those familiar with group work, this may sound like a statement of the blindingly obvious. We were struck again though by how this dynamic benefits from being mindfully and intentionally paid attention to. For example, creating space for support and the maintenance of the consulting team through reflection and robust supervision is critical, especially in situations where the work is complex and challenging – physically, intellectually and emotionally. The use of double-loop learning in check-ins and check-outs with a consulting team is one way to do this work. An example of this is a process by which a group checks in, usually around an open question like, “How are you?” or “What are you noticing?”. Once everyone has spoken, and all the voices are in the conversation, we can then step back and look at what’s been said and see what that means for the system. For example, amongst other things, we may take note and explore what aspects of the check-in reflect the dynamics of the wider system; what biases are showing up; what assumptions are being made; what outlying reactions may need attention? The pervasive masculinity of our world, the whole world. 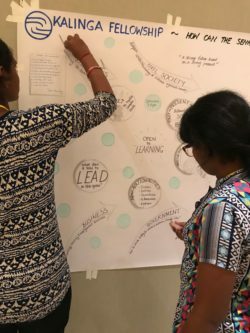 Most of the insights above come from our reflection on how we did the work in Kalinga. We also learnt a great deal about what we were working on. The majority of the participants were women. This was, in part, systemic: people in power sent their representatives, who were mainly women. There were few exceptions, but the men stayed largely on the edges or dipped in and out as they saw fit. There was a propensity towards making this cause a ‘women’s issue’. Many of the initiatives already in motion are about women changing their behaviour in order to find their power or make themselves safe. We contrast this with seeing the matter as a societal issue, as a whole, in which men and women both play a part and men need to change their behaviour and relinquish their power. There is a pervasive mental model of what change-agency looks like that is inherently masculine. Our view is that feminine power looks, feels and sounds very different from the kind of agency we’re used to recognising as powerful. If women are to be treated equally, we need to find, honour and nurture our own version of this, rather than trying to become more masculine to compete directly with masculine power in the system. One of the unexpected and most inspiring elements of the Fellowship was the opportunity to work with students; a group of young women, mainly 18-year olds, who were an inspiration to work with. Their energy, confidence and ability to articulate themselves in a room full of people older and more conventionally ‘powerful’ than them, was a sight to behold. One of the things they shared in the group, was their 10 commandments, created by the founder of their school, Dr Praveen.